Does your double chin have you feeling self-conscious? I’m Dr. Audrey Klenke, M.D., F.A.C.S., with Pinnacle Plastic Surgery, and as the only board certified female plastic surgeon in Beaufort County, I would love to share some good news for those who are ready to leave the fullness under our chin behind. Most of us are aware of injectable treatments that plump, adding volume where we all lose it over time including cheeks, lips, the lines around our nose and mouth, temples and more. But did you know that there is a new injectable on the block that is formulated to melt away the stubborn fat under your chin? Kybella is the brand name for deoxycholic acid, an FDA-approved medication that helps rid you of that undesirable fullness with a simple in-office procedure. Deoxycholic acid is found naturally in the body and helps break down dietary fat so it can be absorbed. Let me walk you through a typical Kybella visit. First we meet in consultation to discuss the risks and benefits of this medication, and we decide together if you are a good candidate. A patient with fullness under the chin and good skin tone who is otherwise in good health is a person who would benefit from this procedure. Next, a topical numbing cream is applied and allowed to take effect for 15-30 minutes. A thorough examination is performed to map out an individualized plan, and finally, a template is applied to the skin to ensure even and precise distribution of the medicine. Small amounts of the medicine are injected and then the template is wiped clean. Patients can expect swelling after the procedure, so you should plan accordingly. Pinnacle Plastic Surgery offers patients a supportive compression garment to help control the post-procedure swelling and speed up the healing process. Most patients need three to five treatments, but some need up to six treatments, each spaced four weeks apart. I generally educate patients to consider Kybella a non-surgical alternative to liposuction, not an alternative to a facelift or neck lift. Patients often ask if the fat can return. The good news is, once the cells are destroyed, they cannot regenerate. Patients should not expect to need additional treatment once the desired effect is achieved. While Kybella is currently only approved for use in the area under the chin, it is being investigated for other areas like the bra line, knees and ankles. So what can we do if you are not a good candidate for Kybella? As a plastic surgeon, my job is to come up with the right plan for you as an individual. There is no one-size fits all solution. Some patients truly would see better results with surgery including a neck lift that helps rid the area of not only fullness, but also excess skin. Some patients have fullness along the jawline often referred to as the “jowls.” This is another area that is better addressed with surgery such as a facelift. 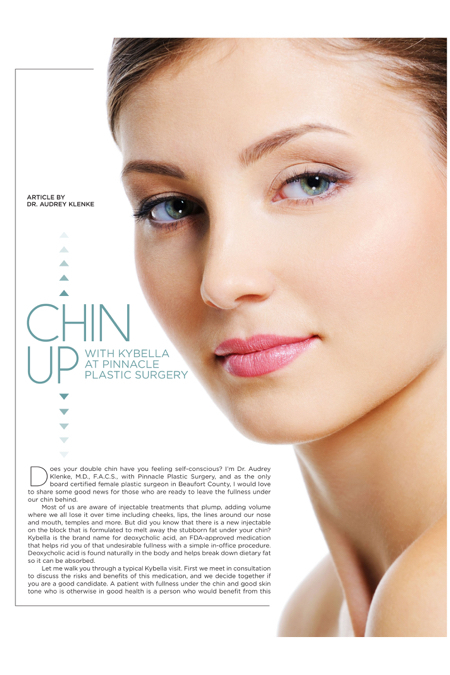 Our team at Pinnacle believes after Kybella, you will feel more confident putting your best chin forward. Get ready for all the profile photos and “selfies” inspired by your new look!